Buying a diamond is an overwhelming and confusing experience. You are about to spend thousands of dollars but you don’t have the first clue where to begin or what to look for. Sure you have heard of the Four C’s, but what do they really mean? Why can two round diamonds, each weighing 1.00 carat vary significantly in size? If you cannot answer this question and are in the market for a diamond, you are at serious risk of being taken advantage of and possibly swindled out of your money. To learn the answer to this question and how to avoid common diamond buying mistakes take our short diamond education course. Traditional jewelry stores want to limit your diamond education since your level of knowledge is inversely proportional to their profits. So how can you prevent being taken advantage of? Our Diamond Education course is full of insider information to protect you. At Top Rate Diamonds we want you to be able to recognize a good deal from a bad one and feel confident about your ultimate decision. Our short course will teach you what you need to know to make an informed decision, compare and negotiate prices, and figure out what diamond is right for you. We will discuss the Four C’s (Cut, Carat, Color and Clarity) as well as some classic scams and mistakes to avoid. So let’s get started with Cut. Carat is commonly misconceived as the size of a diamond, but it is actually a unit of weight. 1.0 carats measures 0.2 grams. Large diamonds occur less frequently in nature, making them rare and valuable. So as carat weight increases, so do the size and value of a diamond. For the average person to detect a noticeable size difference between two diamond, the rule of thumb is for one diamond to weigh 20% more than the other. For example, when looking at a 1 carat diamond you will need to compare it with a 1.2 carat stone to notice a significant difference in size. Use the following chart as a guide to visualize the correlation between carat weight and diamond size (the chart is not to scale and should only be used as a reference). CAUTION: One pitfall to be cautious of when buying a diamond is diamond depth. If a diamond is too deep, the weight is concentrated at the bottom reducing the surface area at the top and making the diamond appear small and narrow. So two diamonds of equal weight but varying depths will measure different widths, which is why a deep 2 carat diamond can actually look like a 1.75 carat diamond. Cut refers to the shape of the diamond and how well it sparkles, making cut the most important criteria to consider when buying a diamond. Below are some of the most common diamond shapes. Shape is usually the first criteria to decide on when shopping for a diamond. 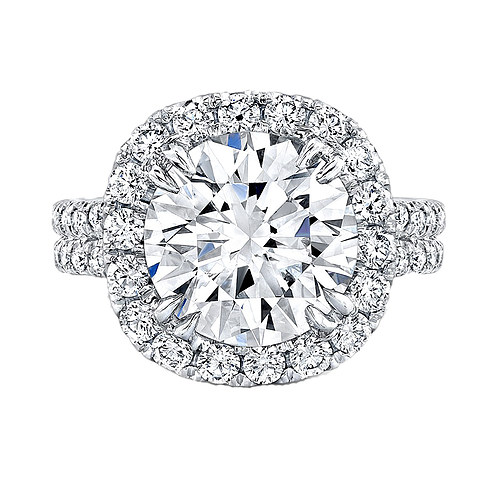 Certain shapes sparkle more than others, with the brilliant round diamond being the most sparkly of all. Emarld and Asscher cuts on the other hand are famous for the geometry of their step cut and not for their spakle. The science behind the cut of diamond is to let in the right amount of light, refract it into white and colored light, and reflect it back as a fiery sparkle. The quality of the cut depends on how well diamond sections are proportioned to one another, namely the Table, Depth, Polish, and Symmetry. Brilliance – The total amount of white light the diamonds reflects back. Dispersion – Also known as “fire,” dispersion is the flashes of color that result from the refraction of incoming light. ScIntlllation – Reflections and flashes of white light off the diamond’s surface as either the diamond, the observer, or the light source move. The manner in which the sections of a diamond are proportioned to one another has a direct impact on the quality of the cut. To understand this relationship let’s first review the five sections of the diamond. Diamonds come in many colors, but the typical scale ranges from colorless to yellow. Nitrogen inside the stone causes it to take on a yellow tint, which in turn decreases the amount of light it lets through. So the Less color a stone has the more brilliant it is and the brighter it shines. Because of this correlation colorless stones are considered most valuable and the value decreases with increasing color. 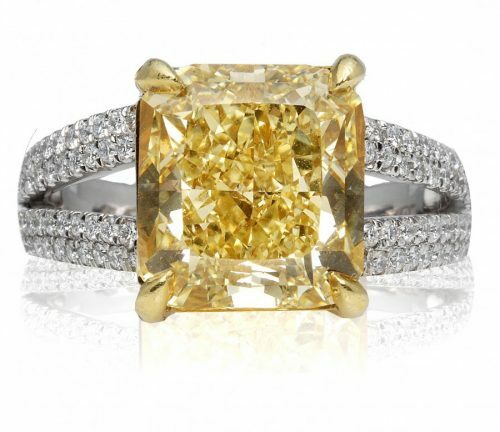 The exceptions to this rule are Fancy diamonds, which can bear a deep yellow color that makes them rare and expensive. The grading scale used to rate diamond color is alphabetical and ranges from D to Z. D represents a purely colorless diamond where as Z is the deep yellow of the Fancy stones. The difference between two consecutive color grades is so subtle that gemologists use a machine to accurately measure the grades. The average person usually requires a difference of at least two color grades to see a difference. Fluorescence is the ability of the diamond to glow in ultraviolet light. It is graded from None to Very Strong and can change the appearance of a diamond’s color. Faint fluorescence has little to no effect on a stone. Medium and strong fluorescence can actually make a low color grade stone appear whiter, but can make a colorless stone appear hazy or oily. Diamonds in the D to H color range with faint fluorescence can actually be a sensible purchase since the fluorescence will have little or no impact on the appearance of the diamonds but will lower the price. For diamonds with color grade of I or lower, look for faint or medium fluorescence since it will make them look whiter. We recommend G color because the diamond still looks colorless and allows you to realize significant savings compared to the colorless collection (D,E,F). For diamonds greater than 1 carat we recommend staying at or above ‘I’ color because color tint becomes more noticeable in larger diamonds and diminishes the purity of the diamond. The clarity of a diamond refers to how clean it is from imperfections, or flaws, which is why a perfect diamond is called flawless and is very rare. Imperfections can be found inside the diamond or on its surface. Internal flaws are known as inclusions while exterior flaws are called blemishes.Gemologists inspect diamonds for imperfections under a 10x magnifying loupe and assign a grade that describes the size, number, and type of imperfections. The higher the grade, the less imperfections and the more expensive the diamond. FL Flawless – No internal or external flaws. Very rare and very expensive. IF Internally Flawless – Free from external flaws. Has microscopic blemishes not visible to the naked eye. Very rare and very expensive. VVS1-VVS2 Very Very Slightly Included – Tiny inclusions or blemishes the size of a pinpoint that are difficult to locate under magnification. Rare and very expensive. VS1-VS2 Very Slightly Included – Small inclusions or blemishes that are not visible to the naked eye. Very high quality and less expensive. SI1 Slightly Included – More imperfections than a VS2, but imperfections are still not visible to the naked eye. High quality and less expensive. SI2-SI3 Slightly Included – Unlike SI1, imperfections may be visible to the naked eye. Good quality and lower price. I1-I3 Imperfect – Has inclusions and blemishes visible to the naked eye. The larger the number grade the more imperfections the stone has. Lower quality and low price, better suited for earrings. We recommend VS2 or SI1 clarity. As long as the diamond appears clean to the naked eye, why upgrade the clarity and spend money on something that you cannot see. Instead, consider spending money on larger carat weight or higher color grade, both characteristics you can see and enjoy. Sellers brand poorly cut diamonds with a misleading name such as “Fire Cut” and try to pass them off as ideal cut. Typically the seller will present the branded diamond next to a diamond with a lesser cut to fool you into thinking the seller’s diamond is more sparkly. Don’t fall for fancy or exotic names. Insist on seeing the diamond certificate and check the cut grade assigned by the lab. A seller may sell you a deep 2 carat diamond that looks like a 1.75 carat and charge you the price of a 2 carat diamond. 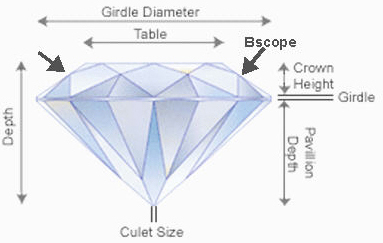 Properly cut diamonds fall into specific depth ranges that vary for each shape. Straying outside these ranges can have adverse effects on the size and sparkle, making the diamond less valuable. If the diamond is too deep, not only will it sparkle less, but it will also look small for its carat size. Buying deeper diamonds is ok, as long as the price reflects the deep cut. On the flip side, a shallow diamond looks big for its carat weigh, but past a certain point the shallow depth hurts the sparkle and makes the diamond look glassy. This means light passes through the diamond instead of getting reflected back out so you can see right through it. A seller may claim a diamond looks big for its size, but be mindful the diamond is not too shallow. And if it is, make sure the price reflects the cut. Know the proper depth ranges of the shape you are seeking. For a list of diamond depth ranges visit our Diamond Cut Education page. Sellers may sell you a diamond with fluorescence without reflecting it in the price. In laymen terms, fluorescence is the diamond’s ability to glow in ultraviolet light. Fluorescence can make a diamond look hazy or oily in sunlight, but at the same time it can make a low color diamond appear whiter. Fluorescence tends to lower the value of a diamond even if it has no visible impact. So if you are buying a diamond with fluorescence make sure the seller reflects it in the price. Look at the lab certificate to find out the level of fluorescence. Learn more about Fluorescence. An appraisal is one jeweler’s opinion about the grade of a diamond and its estimated value. A certificate is a grading report issued by an independent laboratory and typically performed by three gemologists. The two are note interchangeable and both are necessary. The certificate provides independent assurance about the diamond grading so you know what you are getting. The appraisal provides the value of the diamond and is required to issue an insurance policy. Always request a separate lab certificate and separate appraisal. The appraisal should reference the lab certificate number. Keep in mind that issuing a lab certificate costs money, so for smaller diamonds weighing less than 0.75ct it may not be worth the sellers’ cost. Some sellers use bogus certificates from less respected labs with misleading names such as “AGL” instead of EGL, or “IAG” instead of GIA. Such labs can be very generous in their grading or issue whatever diamond grade the seller requests. The certificates are used to exaggerate the quality of the diamond in order to swindle consumers. Insist on a certificate from one of the three most respected labs: GIA, AGS, or EGL USA. You pay for one stone but get another, or the jeweler switches your diamond when you take it in for cleaning. Although the “switcheroo” is the most commonly feared scam by diamond buyers, it rarely happens. The previous ploys described above are more subtle and more commonplace. a) Receipt – When buying the diamond, ask the seller to note the diamond weight and grades on the receipt so you have proof of what you purchased. b) Copy of the Certificate – Before leaving the store, get a copy of the diamond certificate. When you return to pick up the diamond, match the measurements and inclusions to the certificate. c) Laser Inscription – Ask the seller to laser inscribe the certificate number on the diamond for absolute assurance and identification. Top Rate Diamonds offers laser inscription service, so call or e-mail us for more information. Top Rate Diamonds offers 14 days to inspect your jewelry and decide whether you are fully satisfied. If you are not pleased, simply ship the item back and we will replace it with one that meets your standards. If for some reason we cannot replace the item to your liking we will offer you a full refund. Top Rate diamonds does not charge restocking fees, shipping expenses, or any other hidden charges (see policies for more details). Special orders excluded. If at any time you decide to upgrade your diamond, Top Rate Diamonds will buy back your old diamond by crediting you 100% of the original price towards the purchase of a new diamond (see policies for more details). While most jewelers and wholesalers will only offer you 30%-50%, we offer a full credit. Our loose diamonds are of the highest quality and to prove it we are always willing to buy them back.On the flip side, a shallow diamond looks big for its carat weigh, but past a certain point the shallow depth hurts the sparkle and makes the diamond look glassy. This means light passes through the diamond instead of getting reflected back out so you can see right through it. A seller may claim a diamond looks big for its size, but be mindful the diamond is not too shallow. And if it is, make sure the price reflects the cut. Free cleaning for jewelry purchased from us. We warrant that all our jewelry is free of manufacturer’s defects, for life! We take an honest, truthful approach to doing business and are straightforward with our customers. We pride ourselves in adhering to the strictest ethical and moral standards because we want you to feel absolutely confident in our integrity and the integrity our diamonds. But don’t take our word for it, read what our customers have to say. All purchases over $500 are shipped free of charge via Fed-Ex overnight delivery and are fully insured.